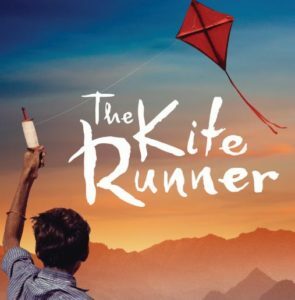 The Kite Runner first appeared as a novel in 2003, the first work of author Khaled Hosseini. It soon became an instant bestseller across the globe and has since been published in 70 countries, selling 31.5 million copies in 60 languages. The book was soon made into a film in 2007 but a theatrical script had already been produced before the film was released. 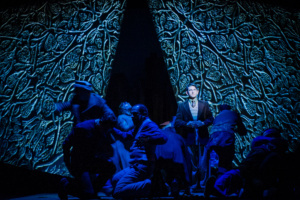 It didn’t appear on stage until 2009 when it was produced in San Francisco by The San Jose Repertory, and won five San Francisco Bay Area Theatre Critics’ Circle Awards. 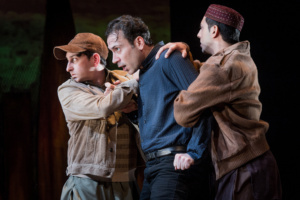 In 2013 Nottingham Playhouse and Liverpool Everyman & Playhouse secured the rights to stage the European premiere of The Kite Runner. The subsequent production toured the UK and received positive reviews from the public and critics. 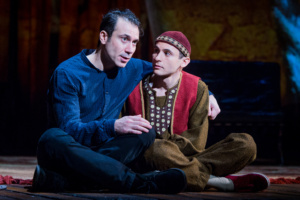 Original director Giles Croft stays with the production for this transfer to the West End. I was probably one of the few people in the audience to have neither seen the film nor read the book, so I had no preconceived ideas about what to expect. What appears an incredibly simple, but beautifully effective set design (Barney George) takes us to 1970s Kabul. 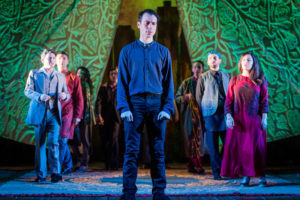 The sound of the tabla resonating as we meet Amir (Ben Turner) and his closest friend, Hassan (Andrei Costin), the Hazara servant of his father. The play is told through Amir’s eyes. From his childhood and the carefree afternoons of kite flying tournaments with Hassan, to the tragic events where it all started to go wrong. 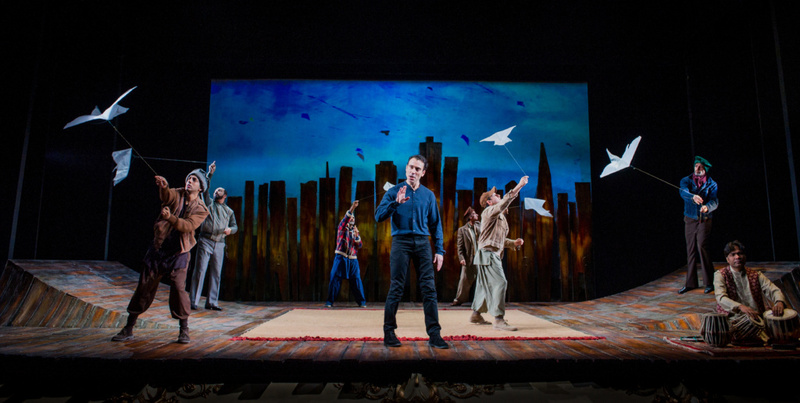 With a nation split and little alternative other than to flee, the play has eerie overtones of situations around the world we are still experiencing today. 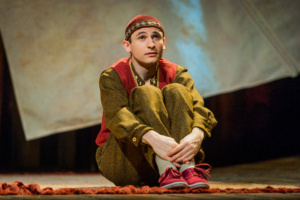 This is a deeply poignant tale of family and friends separated by creed, war and ignorance. 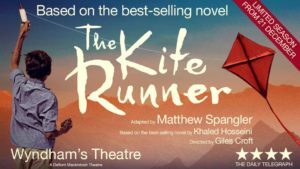 The Kite Runner is one of those rare plays that can take you through almost every emotion; anger, sadness, joy and at times utter helplessness at the plight of the Afghans. There are moments of light relief, and some great comedy lines – many from Amir’s father, Baba (Emilio Doorgasingh), whose justification of why drinking Scotch isn’t a sin, you just can’t argue with! Some of the more disturbing scenes from the book are portrayed out of sight, but are no less harrowing to watch. 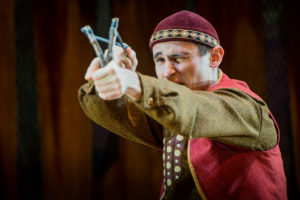 Outstanding performance in these scenes goes to Andrei Costin as Hassan. By the end of the first act, I’d envisaged this would be a five star show (unless it took an enormous down turn in act two). I wasn’t disappointed, the second act was if anything more engaging than the first. The spiral of emotion there again yet emphasising the power of the human spirit never giving up hope. Many of the reviews I’ve read have compared this production to the book and the film which is a bit of a disservice to the play. It is different, it may not be as you remember the novel to be, but please give it a go. 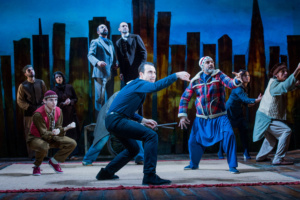 This is a brilliant piece of work, outstandingly acted by a talented cast. The first ‘must see’ of 2017.